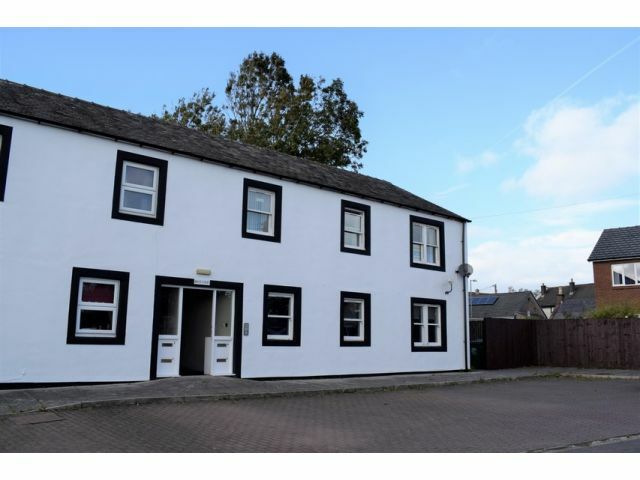 Located in the popular commuters village of Kirkpatrick Fleming, offering easy access to the M74 North & South. All amenities associated with large towns can be found in Lockerbie and Annan which sit approximately 7 miles from the village. Providing a spacious open plan Lounge and Kitchen, Two Bedrooms and a large Bathroom with separate shower cubicle. 4 Bruce Court benefits from communal off road parking and a shared drying area with paved section. Loft access. Ceiling light, smoke alarm, large walk in storage cupboard with ceiling light and carpeted flooring (could be utilised as an office or laundry room). Telephone point. Electric radiator, carpeted flooring. Window to front with curtain pole. Coving, ceiling light, TV point. Electric radiator, carpeted flooring. Continuation of coving from Lounge, ceiling light. Range of wall and base units and worktops with breakfast bar area from Lounge. Integral oven, four plate ceramic hob and cooker hood extractor. Stainless steel sink and drainer with mixer tap, tiled splashback. Space for under counter fridge, integral freezer. Vinyl flooring. Window to front with curtain pole and blinds. Ceiling light. Electric radiator, carpeted flooring. Ceiling light, extractor fan. Toilet, wash hand basin with shaving point and light, bath and separate shower cubicle with electric shower. Electric heated towel rail and electric radiator. Wood effect vinyl flooring. Communal parking to front of building and shared drying area to side with rotary clothes dryers and paved section. Offers in the region of £72,500 are invited and should be submitted to lj Residential, 93 High Street, Annan, DG12 6DJ or by fax to: 01461 205037.